Neck-wrenching acceleration, excellent handling, agreeable ride, distinctive looks, reasonably priced. Too much supercharger whine and not enough V8 rumble, rough-around-the-edges automatic transmission, standard seats lack support. The Cadillac CTS-V is new for 2009. Ultimate 750HP Stock Motor Cadillac CTSV - "The Grocery Getter"
Back when the first-generation CTS was still in production, the folks at Cadillac had a bright idea: Shoehorn a Corvette engine into the CTS, slap on an array of go-fast goodies and give the traditional kings of the super-sedan hill — BMW’s M5, Mercedes-Benz’s various AMG sedans and Audi’s S6 — something to worry about. 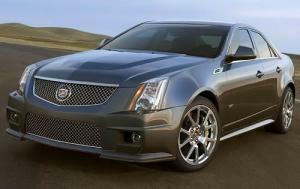 Cadillac called it the CTS-V, and its performance numbers were indeed impressive, as was its relative affordability. In other ways, however, it wasn’t quite ready for prime time, from its low-buck interior to its pronounced rear-axle hop during acceleration runs. This year, it’s a whole new ballgame. The 2009 Cadillac CTS-V, based on the vastly superior second-generation CTS platform, ditches the axle hop, gets a first-rate interior and — perhaps most importantly — achieves record-breaking four-door speed. The 556-horsepower, supercharged 6.2-liter V8 (which is essentially a slightly detuned version of the same motor found in the Corvette ZR-1) helps the new V put down some ridiculous straight-line times: zero to 60 mph in 4.3 seconds and the quarter-mile in 12.4 seconds at nearly 115 mph. Moreover, the CTS-V is equally impressive when the going gets twisty. In a recent comparison test, we found out for ourselves what Cadillac had been telling us all along — the V is quicker than both the M5 and the C63 AMG around a racetrack, despite a base price that’s nearly $25,000 less than the BMW. Stupendous performance aside, there are a few demerits worth mentioning. First of all, it’s hard to tell from the driver seat that there’s a V8 under the hood. Supercharger whine is omnipresent, and the expected V8 rumble is AWOL. Second, the automatic transmission can feel crude at times, thanks to a slow-witted manual mode and rough upshifts in both Sport Drive and manual modes. Furthermore, the standard seats aren’t much different from those in the regular CTS, which is disappointing in a dedicated sporting machine — although the optional Recaro sport seats are beyond reproach. The super-sedan segment is an embarrassment of riches these days, with numerous German entrants boasting sophisticated designs, sports-carlike handling and sonorous V8 or V10 engines. But the 2009 Cadillac CTS-V has elbowed its way to the head of this rarefied class with its unparalleled all-around performance, stylish sheet metal and reasonable pricing. We’re particularly fond of the smaller M3 and C63 AMG sedans, which compete directly with the Cadillac on price, yet the dimensions of the CTS-V put it more alongside bigger, much more expensive rivals. Super-sedan shoppers owe it to themselves to take a hard look at this hard-core Caddy.